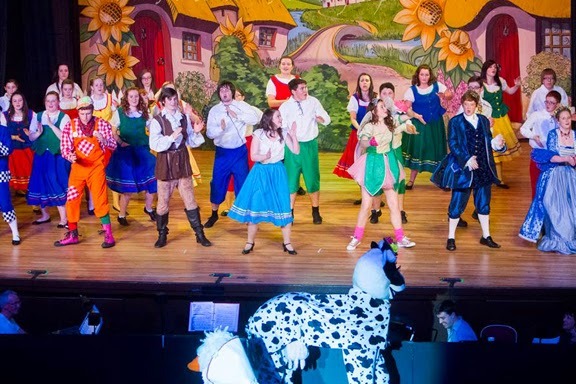 It is really hard to believe I've been in fourteen songshop shows now including four pantos. 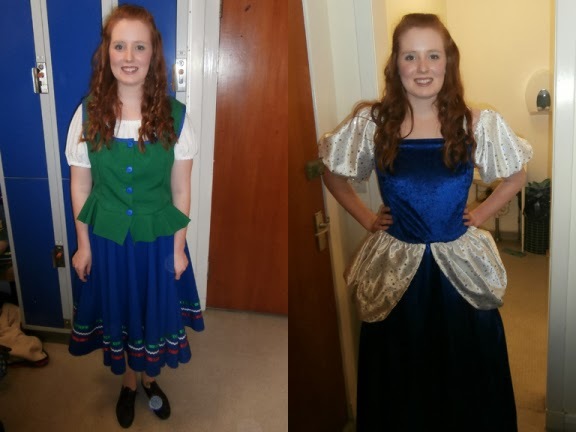 I did a post about our last show 'Grease' and I think you guys enjoyed it so I decided to show you what I was up to last week and what I wore when we did 'Jack and the Beanstalk'. For a change I only had one main outfit and a fancy ball dress for the finale. Every night I went in a six, curled my hair and had my make up done before the show started. I was in seven big dance number so it was quite a lot of work keeping up the smile all night and not letting the energy drop. It was helped by the baking we get at the interval and several bottles of water. While it is lots of fun I'm glad I'm not going to rehearsals for a while. These are the photos that are taken by a photographer for songshop and they are all stuck in the front of house for everyone to look at before the show. Can you spot me in each of them? They are always slightly dodgy because smiling and singing doesn't make for good stills but the overall performance would look good. These are my two outfits both made especially for me. 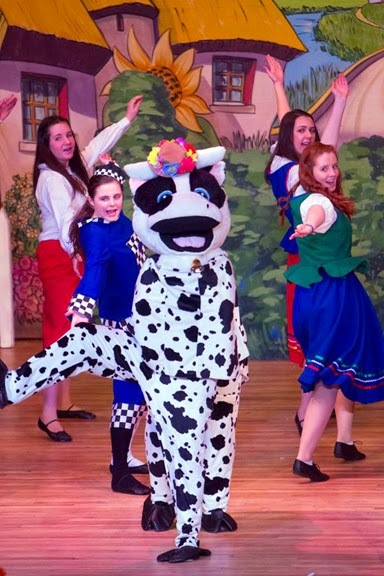 The photo to the left is my villagers outfit and I wore it for most of the show. I thought the peplum waist coat was really cute even though green isn't my fave colour (I hate it) oh why oh why couldn't I have been in the red? The other dress is for the bows and finale. I loved the velvet and silky feel- I look quite pretty in it too? 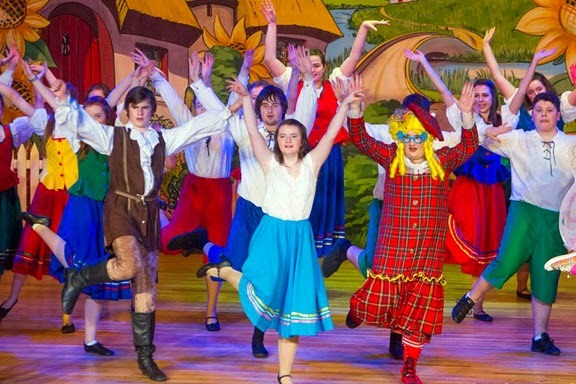 For those of you who don't know the story of the panto (I didn't) it centres round the village of merridale which is terrorised by a giant and his evil servant fleshcreep. When Jack asks his girlfriend Jill to marry him she says not until he gets a job but she gets captured by fleshcreep and taken to the giants castle. 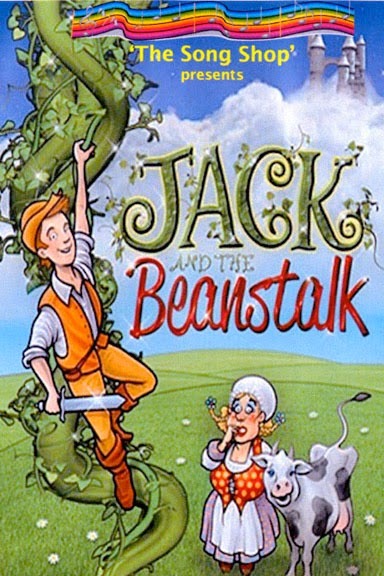 Jacks family (mum, the dame, and his brother Simon) have to sell their dairy cow for some money but are tricked and end up with beans which the fairy turns into magic beans and the beanstalk grows. In the second act most of the principle parts go up the beanstalk to recuse Jill and daisy. 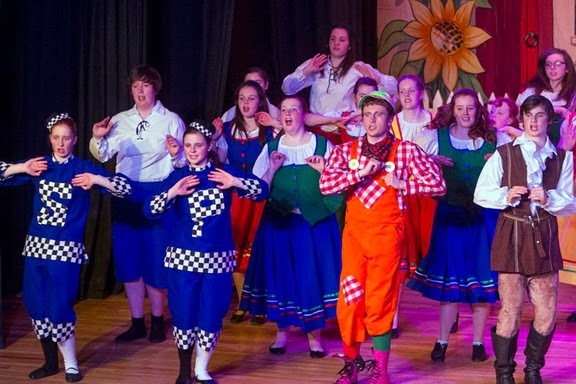 The villagers are also up there and are possessed the giant and do a mad dance to Transylvania mania (look it up its pretty cool) but long story short with lots of joking and being general idiots they all get back to merridale and chop the beanstalk down and the giant dies.